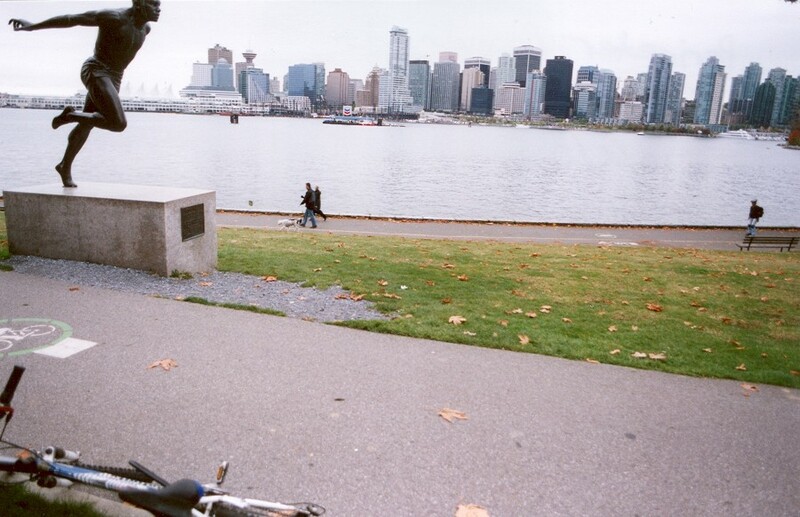 For years, I have been eager to experience Vancouver, British Columbia. I have heard so many remarkable things about the city. Finally, in the fall of 2005, Maureen asks me if I am interested in joining her to a trip there. Before she finishes asking, I am already enthusiastically agreeing to join her. Isn't it time for my plane to depart yet??? So with anxious expectations, I board a Continental jet in Jacksonville, Florida. In my departing email, I have informed friends that I will cast an unforgiving eye on the merits of this highly-touted city. From SeaTac airport, we depart for Camano Island, where we are to pick up Maureen's father. We drive north toward Canada, enjoying the changing colors of the approaching fall season; the colors so unseen to Floridians such as us and so brilliant in hue that the rainbow tree colors do not seem real. Adding to this surrealism is an abundance of farms sporting vast collections of pumpkin patches ready for the approaching Halloween. As we drive west on Route 99, the mighty Vancouver skyline looms to our right-almost as if we are going to drive past it. But soon the highway veers north and we quickly find the Victorian Hotel downtown, which turns out to be a reasonably priced, centrally located, impressive hotel that we feel fortunate to have been referred to. 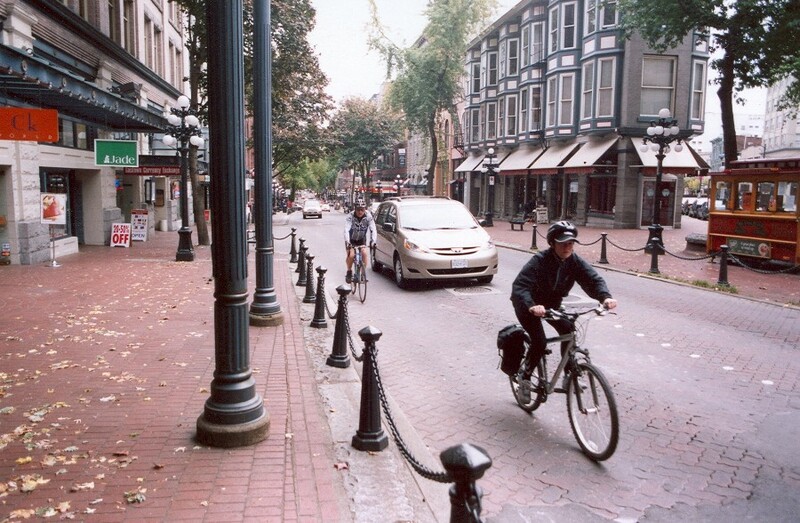 Quickly, I rent a mountain bike from the hotel and my first destination is the Gastown Neighborhood (see photo). Interrupting my visit is an irresistible establishment: A Vancouver microbrewery (Steamworks Brewery), which a brewer such as me is unable to pass up. There for lunch, I sample local oysters and their on-site-brewed Coal Porter, which turns out to be silky smooth. Gastown is just around the corner, and I am immediately impressed. Before me is a quaint, romantic, historic neighborhood with lively, historic buildings, a number of pedestrians, and well-behaved cars. Within a few steps, I stumble upon one of the most beloved, photographed features in downtown Vancouver: The SteamClock. Today is my lucky day, as it just happens to be noon, and those of us gathered around the proud clock are treated, literally, to a steaming hooting, as the clock plays a little tune at noon. Departing with a smile on my face from the delightful clock, I quickly find myself bicycling on the vibrant, well-used, delightful Vancouver promenade, which is a paved path looping around the shoreline of the downtown peninsula. The promenade serves as a wonderful social condenser, where city residents are able to socialize with their fellow citizens and enjoy the magnificence of their city skyline. As an aside, though, I worry about whether the promenade drains pedestrian and bicycle vibrancy from the downtown it skirts around. One thing that quickly becomes clear to me along the promenade is the remarkable number of glass-encased, modernist skyscraper residential buildings in downtown Vancouver. In my opinion, five stories is the maximum height that a city should allow for non-civic buildings, as that height represents the threshold for human scale. Hi-rise buildings in Vancouver are often tall structures sitting alone in open areas. My preference for walkability and urban health is more of the Paris approach, where a tight, uninterrupted urban fabric of continuous buildings - no taller than five stories - is established. In Vancouver, the relatively isolated towers - while usually embellished with features such as fountains or parks - don't provide a sufficient "sense of enclosure." By dwarfing the pedestrian, these towering buildings make a person feel a bit like an insignificant little insect. On the other hand, I should note that these tall residential structures provide a good deal of urban health to downtown Vancouver. The towers feed the sidewalks with a large volume of pedestrians. This supports a rather impressive collection of small shops, corner groceries, neighborhood-based schools, and an overwhelming selection of superb, varied restaurants. I would also applaud Vancouver for its ability to avoid the oh-so-common problem of a city having "gaptooth" parking lots that interrupt and degrade urbanism. In downtown, such gaptooths are nearly non-existent. Vancouver streets are not awful in comparison to most city streets I have seen in North America. Bicyclists tend to be served fairly well, and the cars tend to seem fairly well-behaved. However, I found that the city has too many one-way streets (which generally increase motorist speeds and reduce motorist attentiveness). Also, too many of the streets lack on-street parking, and too many of them are multi-lane monsters of 4-6 lanes. While the City is certainly to be commended for its refusal to damage itself with limited-access highway overpasses, it would seem that it has blundered in a less serious way by enabling regional, sprawl-inducing, higher-speed car travel with its one-ways, its multi-laners and its lack of on-street parking (each of these three factors tend to be used as a way to provide "escape routes" for suburban motorists, instead of being compatible with urbanism). One of my destinations on this day is Yaletown, which is billed as a "hip," "cool," "alternative" neighborhood. Sure enough, the streets here are quite walkable. And the neighborhood shops and restaurants seem healthy and happy. While I enjoyed the neighborhood, I was struck by the noticeable number of dumpsters that were sitting along the street. This character suggested to me that the streets in Yaletown were perhaps formerly alleys, and the "hipster" population in Vancouver had migrated to these alleys to escape the somewhat hostile multi-lane streets in the downtown. They have done well, if this is the case, as Yaletown is an impressive haven for those seeking a walkable lifestyle. Robson Street is packed with bright, active, diverse retail and restaurants. It is the main drag in downtown Vancouver, and is therefore bustling with pedestrians. A fun street to walk. Well done, as well, because it is a two-lane street with on-street parking. The sidewalks here are quite wide, and the City is able to get away with the width because the volume of pedestrians is so high. 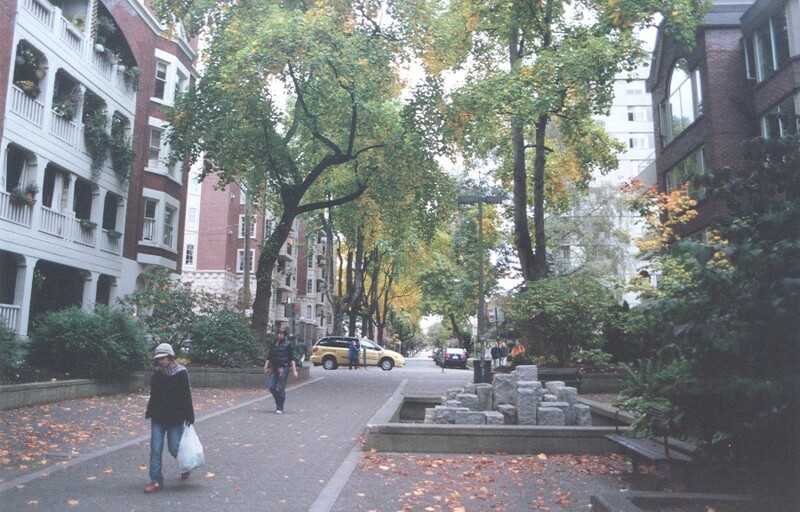 Crossing Robson are a good number of high-quality, tree-canopied streets containing quality neighborhoods (see photo). And in the fall, these streets are particularly striking as the fall color in the leaves adds a quite pleasant, visually colorful ambience. At Cardero Street near Robson, one finds a neighborhood-based school and corner grocery nestled into a leafy, quiet, traffic-calmed neighborhood graced with historic homes in buildings no taller than three to five stories. One strategy that the City uses to calm neighborhood streets is to take out a section of street and convert it into a car-free plaza that diverts cars from the street. While this method adds a nice amenity to the neighborhood, I have some concern that doing so loads too many car trips to other streets, and makes navigation by non-residents more difficult. Despite the fact that it would appear that Vancouver's climate delivers drizzle 24/7 throughout the year, this somewhat inclement weather does not seem to discourage folks from walking. It would seem that in Vancouver, residents have just grown to live with the weather. A good example of this "learning to live with the weather" attitude is that the downtown has quite a few outdoor cafes along sidewalks. Interestingly, I observe that a quite large percentage of Vancouver residents are Asian. Perhaps more so than in any city I have visited in North America. For dinner on the first night in Vancouver, we go to Stepho's Greek Restaurant. Quite authentic and delicious food is served here. Food portions are enormous, and are provided at astonishingly low prices. On our second day, we visit Granville Island. A popular recommendation for places to visit in this city. I find myself a bit disappointed by the fact that while Granville is a walkable place (under an elevated bridge overpass), it is rather touristy in ambience. We happen upon the Public Market. The market is an exhilarating culinary delight (see photo). I find myself feeling overwhelmed by the dizzying, seemingly endless tables overflowing with fresh, delicious-looking, perfect fruits, vegetables, meats, seafood, breads, cheeses, pastas, and confections. My stomach growls as I walk along the displays, as everything looks so yummy. One could spend weeks enjoying a walk through this festive place. I enjoy it so much that I realize that if I lived in Vancouver, I'd make it a point to visit the market at least once or twice a week. 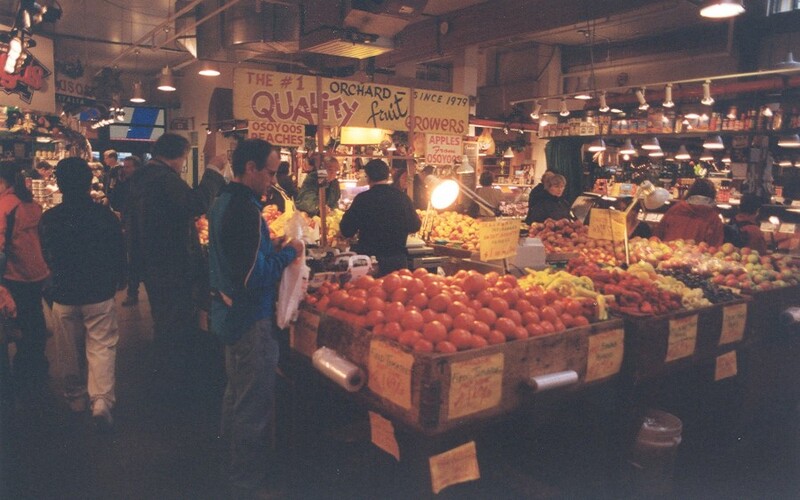 I am surprised to report that this market puts the much more famous Pikes Place in Seattle to shame in terms of its delightfulness and its imposingly diverse offerings. Stanley Park at the Northwest portion of downtown is an amazing urban park. Quite large in size, it contains old-growth forest with trees that are awesome in size. Inside the park is the Vancouver Aquarium. The Aquarium is extraordinary. A great many cute, graceful little marine animals, such as the ever-charming sea otters, sea lions, and dolphins. In particular, the beluga whales are worth the price of admission. From windows below the water surface, one sees these enormous white whales with large bulges throughout their bodies, yet swimming most stylishly. It rains all day on our second day in Vancouver. I happen upon Von's on Pine Street for lunch, and am treated to an outstanding Deschutes Black Butte Porter (brewed in Bend, Oregon) to go along with a filling, tasty lunch (I find the Thai Ahi Wrap to be a scrumptious treat). Here, I also sample Rogue Dead Guy, brewed in Newport, Oregon, Elysian Immortal IPA, brewed in Seattle, and Mac and Jack's African, made in Redmond, Washington. Mac and Jack's is especially flavorful. On balance, would I rate Vancouver one of the world's great cities? Is it, as The Economist recently christened it, the "most livable city in the world"? Frankly, I am ambivalent. Vancouver has many, many impressive features. Most noteworthy, in my opinion, is the unique absence of highway overpasses in its urban area. But there are important design flaws that diminish it. In particular, the many high rises, and the many downtown streets that are four or six lanes (too often one-way and too lacking in on-street parking). In the end, though, if I were forced to make a decision, I would add Vancouver to my list of the world's great cities simply because the City tries so admirably hard to be great — and in many ways, achieves that greatness, despite its important flaws. If your intentions are good, and you are persistent, you can eventually be rewarded with excellence. My final day in the Pacific Northwest is spent in downtown Seattle, where I notice a much larger number of parking lots, to Seattle's discredit, than in Vancouver. I walk to Pioneer Square in Seattle's version of Little Italy. DeNunzio's is exceptionally authentic and full of the Italian flavors I've come to appreciate growing up with a mom who makes the best home-made Italian dishes in the world. To finish my tour of microbreweries, I sample the Pike Pub and Brewery. Naughty Nellie Ale is very good. The best of what I taste is XXXX Stout - a dark-roasted, delightful taste.